I guess if you have the creative genes inside you, you will understand where I am going. I know my classmates like Jim, Barbara, Eddie, Rainer and a few others know what I am talking about. Sometimes, often several times a day, strange ideas pop into your head or you see or hear something that triggers a little spark in you and you feel the need to express yourself. It doesn't matter if you are a songwriter, a poet, an artist or what, you can't control it. Things just do that to you. Personally, I don't know why sometimes strange memories come to me. This morning something keyed a thought in my head about matchsticks.With today's dependence upon BIC lighters and butane lighters for grills, I don't know if we have a box of matches anywhere in our house. When I was growing up I know they were staple utility items in my family's house. Maybe the decline in smoking has added to their demise? When my family first moved into the house on East Clinton Street, the only heat sources we had in the two story house were coal burning fireplaces. We wadded up newspapers and lit the fires with matches. Rude or crude, I remember a box of matches was always kept in our bathroom. Instead of a can of spray floral scented aerosol to cover up those smells which occur in a bathroom, my family would want users to strike a match instead. It was cheaper, and the sulfur smell of the old matches would cover most any odor created. I personally hated the smell of the sulfur more than what it was meant to cover up, but I still remember all the times I was ordered to "Strike a match!" before I left the bathroom. Of course matchbooks were a major form of advertising back then, but they seem to have lost favor with companies now, and you don't normally see them laying around on counters the way they once did. Wooden matches were much more useful to me than the paper ones in matchbooks. If you remember, there were two types of wooden matches available when we were growing up.. One type was called "Safety Matches" and the other was "Strike Anywhere Matches." The Safety Matches could only be lit by using the striker on the side of the box. Light anywhere were just that - you could light them almost anywhere, the box, a zipper, your front teeth even. 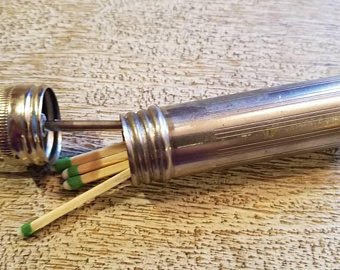 As a Boy Scout I preferred the strike anywhere ones and I still remember making them waterproof by melting a block of Gulf wax and dipping the heads of the matches into the melted wax to cover the tips with paraffin. Out in the field I could easily scratch the wax off the tip and strike the match against any rock or zipper I could find. When that was too much trouble, I could always pack a stack of matches in my trusty Boy Scout waterproof match holder to keep them dry while camping in the woods. 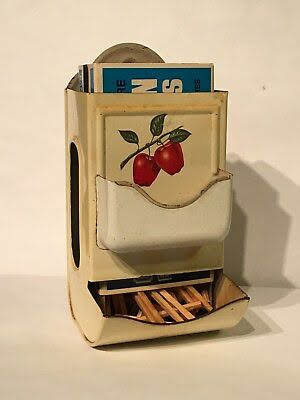 Many kitchens had a cast iron or country motif match box holder hanging on the wall by the stove which held a standard box of kitchen matches. But for me, wooden match sticks were much more useful than just for lighting a fire. I remember using them as miniature Lincoln Logs and building forts on the kitchen table for my toy soldiers. I also used matchsticks to make my own darts. I would break off the head of the match and stick a needle in the end. Then I would use a razor blade to cut a slit in the other end and use notebook paper to fashion a tail for the dart. They were fun to play with and became deadly arrows when I cast them at the men I would make out of modeling clay. I also used matches to build little rockets made with aluminum foil. I have included a youtube video of how to do that. It was fun, and almost a necessary rite of passage when you grew up in The Rocket City. There was another trick I learned and that was how to position a match head on the striker of the matchbox and then flick it with my fingers making it light as it flew across the room. Matches were a common form of poker chips for those of us who were too poor to buy real ones, and some folks even used them for toothpicks. If you told today's generation that "Three on a match was bad luck" I doubt they'd have any idea what you were talking about, but we grew up with that expression and probably some of our generation still believe the superstition. I looked it up on the web and found out where it came from. Three on a match (also known as third on a match or unlucky third light) is a purported superstition among soldiers during the Crimean War to World War II. The belief was that when the first soldier lit his cigarette, the enemy would see the light; when the second soldier lit his cigarette from the same match, the enemy would take aim at the target; and when the third soldier lit his cigarette from the match, the enemy would fire, and that soldier would be shot. Since then it has been considered bad luck for three people to share a light from the same match. This superstition has become part of popular Western culture in films, novels and other art forms. By the way, if you wondering what ever happened to "Strike Anywhere" matches I'll let you in on the reason. Because they will strike anywhere they were declared a hazardous material and I have heard it can cost between $35 and $50 to ship them. Here is what the US Post Office says about shipping matches. Safety Matches - Safety matches have treated match heads that will only ignite when struck against a specially prepared surface like a match book, card, or box. Safety matches may be shipped domestically using ground transportation. Safety matches may not be sent by air or mailed internationally. Strike-Anywhere Matches - Strike–anywhere matches will light from friction against any surface. Strike-anywhere matches may not be mailed domestically or internationally. Oh, and how many times during your childhood were you told "Don't play with matches!" So, can any of you "Match" or add to my match memories? Memphis, TN - For the sports minded people, we are entering one of our favorite times of the year. March madness is almost upon us and The Master's is just around the corner. Lots of television time and snacks in front of the set coming. Some of you lucky ones will be witnessing some of the action in person. If any of you are going to go to any of the NCAA tournament games or watching the Master's in person - sound off. Hello to all of you fellow Lee Generals from the classes of ’64, ’65, and’66. It’s that time again! Be sure to save the date for our upcoming spring luncheon. As always, we meet on the last Thursday of April and October of each year. No excuses for not putting those dates on your calendars in advance. This year begins our ninth year for the Lee Lunch Bunch, so I hope to see as many of you as possible this time. Please do, if possible, let us know if you plan to come by phone, text, email, or Facebook. Hope to see you there! Tommy - I will be having Open Heart Surgery on March 13 - my heart is strong and I have no blockages - but - I have a very leaky valve and an AFIB issue - need to have it fixed while I am still young and strong. My wife of 45 yrs - Kathy - will call Jerry Brewer with good news after the surgery. I am confident that God will not take me . Why would he? He has had so many better opportunities and passed - I must have more to do. 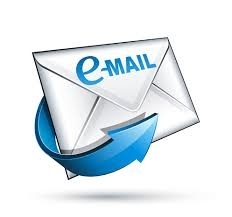 I would like to be on your mailing list. My brother sent me the last(?) issue which brought back many memories of Lakewood. Lakewood resident beginning 1958 – lived across the street and down two houses from Glen James and his family.